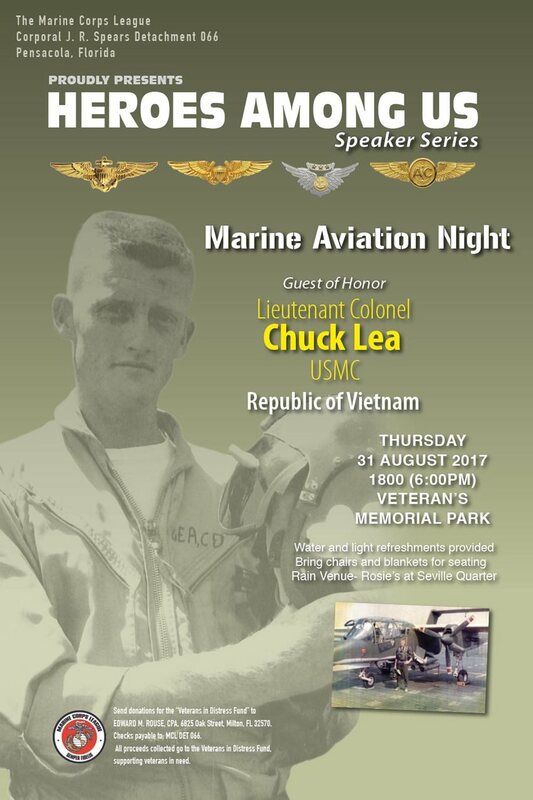 The MarineCorps League’s 5th Annual Heroes Among Us Speaker Series-2017 - Guest of Honor LtCol Chuck Lea, USMC, Republic of Vietnam. Pensacola,Fla. – The Cpl. J.R. Spears Detachment of the Marine Corps League announces its5th Annual Heroes Among Us speaker series event Marine Aviation Night for 31 August 2017 to be held at Pensacola Veterans MemorialPark. Charles D. Lea (Chuck) was born 26 August 1943 inCarthage, AR. After graduating from high school, he attended Southern StateCollege before enlisting in the United States Marine Corps as a private inJanuary 1963. He qualified for flight school and was ordered to Naval AviationTraining Command in August 1963 with the rank of Marine Aviation Cadet(MARCAD). 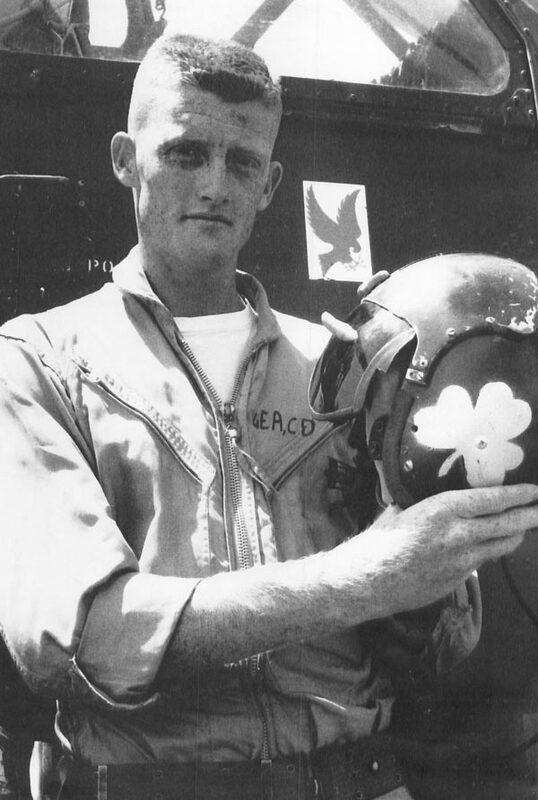 In May 1965, he received his commission as a Second Lieutenant andwas designated a Naval Aviator. U.S. for duties as aflight instructor for two years, flying the T-28 Trojan with VT-3. From December 1968 to December 1969, he was ordered to the FirstMarine Aircraft Wing, flying the OV-10 Bronco with Marine Observation Squadron (VMO) 6, located at Quang Tri,Vietnam. The Bronco is a twin-engine, armed reconnaissance aircraft designedfor Forward Air Controller Airborne [FAC(A)] missions, airstrike mission coordination, downed-pilot rescue, assault troop insertion and photo reconnaissance. Captain Lea returned toattend the College Degree Program (Bootstrap). After receiving his Bachelor'sdegree in August 1971, he transitioned to the A-4M Skyhawk. He flew the A-4Mout of Beaufort, SC with Marine Attack Squadron (VMA) 324 from November 1971until June 1974. He was ordered to the First Marine Aircraft wing from June 1974 until July 1975. Major Lea participated in operationalmissions. Following various training and staffduties, including the Armed Forces Staff College (AFSC) in Norfolk, VA; LtColLea studied at the Naval Postgraduate School (NPS) in Monterey, CA from July1979 until April 1981, where he received his Masters degree and was promoted toLieutenant Colonel (LtCol). After staff duties with the Fourth Marine Air Wingin New Orleans, LA and the First MarineAir Wing in Japan, he was assigned to the Third Marine Air Wing in El Toro, CAin July 1984. He retired from the United States Marine Corps in September 1986. LtCol Lea's Military awards include:Three (3) Distinguished Flying Crosses (DFC), Two (2) Purple Hearts, Seventytwo (72) Air Medals, the Meritorious Service Medal, Two (2) Navy CommendationMedals with Combat "V," Combat Action Ribbon, Presidential UnitCitation, Navy Unit Citation, Meritorious Unit Commendation, National DefenseService Medal, Vietnamese Campaign Medal with 4 Stars, Sea Service DeploymentMedal, Republic of Vietnam Cross of Gallantry with Gold Palm, Republic of VietnamCivil Action Ribbon and the Republic of Vietnam Service Medal. Following his retirementfrom the Marine Corps, Mr. Lea was hiredby American Airlines and flew for them for almost 18 years, flying the Boeing727, McDonald Douglas DC-10 and MD-80 and Boeing 757 and ER 767. Along withother airlines, American is obligated to supply airlift for Military forcesduring National emergencies. He participated in these Civil Reserve Fleet(CRAF) missions during Operation Desert Storm in 1991. Mr. Lea made Captain forAmerican in January 2000. He retired from American in September 2003. Mr. Lea currently resides inPensacola, FL with his wife, Ellen. They have three children: Rhoda Ellen, ofNew Haven, CT; Julia Coleman (Lea) Erickson of Austin, TX and Charles Robertson(Chip) currently serving in Iraq.